Cowboy Dressage emphasizes soft feel and harmonious partnership with the horse—an ideal any cowgirl can aspire to achieve. 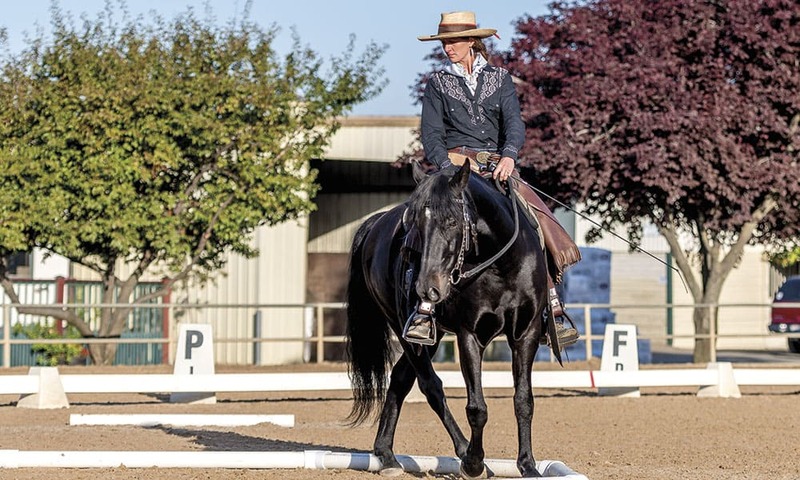 One of the key differences between Western Dressage and Cowboy Dressage is that Cowboy Dressage requires maneuvering over, around, and inside ground poles. Photography by Maria Marriott. 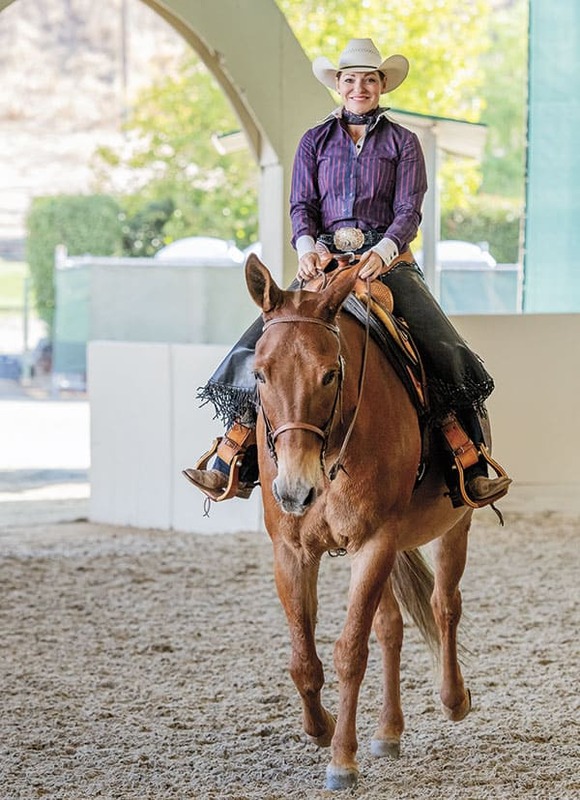 From ponies to Percherons, from mustangs to mules, equines and their riders convened in Rancho Murieta, Calif., this past October to learn from master horseman Eitan Beth-Halachmy, from each other, and to compete in the 2018 Cowboy Dressage World Gathering and Finals. 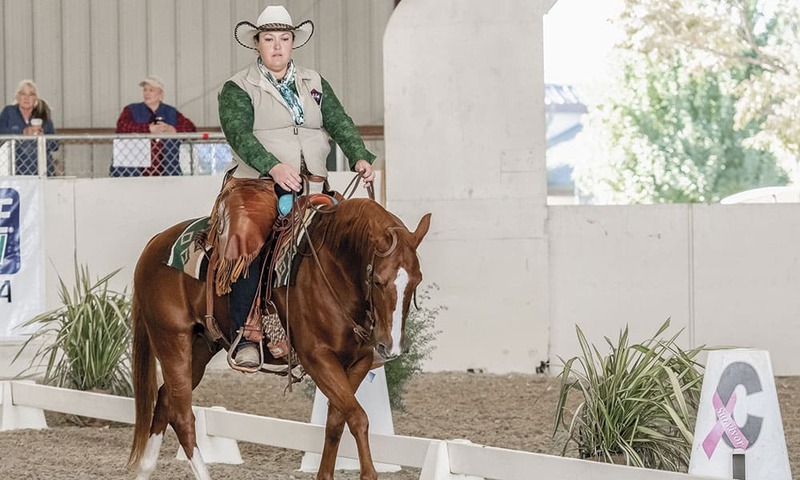 The discipline of Cowboy Dressage, with its emphasis on building a relationship of lightness, sensitivity, and harmony with your horse, resonates with cowgirls from all walks of life and from all riding disciplines. So, it comes as no surprise that women rode off with seven of the top ten finishes in the Top Hand event. Debbie Beth-Halachmy demonstrates “soft feel” at the Cowboy Dressage World Gathering. Cowboy Dressage traces its origins to the early ’90s, when Eitan—known to friends as simply “Eight”—developed a unique approach to training that he would showcase in performances on Morgan stallion Holiday Compadre. The Israeli-born horseman—who aspired to be a cowboy from the age of 5—began his horsemanship training when he was 13, under Adam George, director of the Israeli National Stud, and later worked mucking out stalls at the Spanish Riding School, where he became enchanted with the harmony between horse and rider. He would then study pre-veterinary medicine in Vienna before coming to the United States on a student visa to study at the University of California, Davis, before pursuing his dream of finally becoming an American cowboy, training horses and teaching horsemanship fulltime. Eitan and his wife Debbie—an accomplished rider in her own right and the owner of the celebrated Holiday Compadre—together have forged a vision for the art of Cowboy Dressage. Based upon kindness and partnership with an emphasis on soft feel, the seeds of the Cowboy Dressage philosophy that Eitan and Debbie have nourished are being borne homeward by the participants who then teach students of their own, thus encouraging Cowboy Dressage to spread organically across America and around the globe. Jesseca Hutchings, who finished second in Top Hand, was recently inducted into the Horsetown USA Hall of Fame as a trainer. Tanja Kraus, the 2018 Top Hand winner also scores as the gal who traveled farthest to attend. Hailing from Australia, Kraus and her partner—horseman Phil Monaghan, who also competed this year—have competed in the World Gathering since 2015. Riding a borrowed horse on which she had limited experience to this year’s win is a testament to Kraus’ ability to tune in to a horse’s mental, emotional, and physical energy in a gentle, harmonious way. She’s a full time clinician, operating Tanja Kraus Horsemanship in Coffs Harbor, Australia. In addition to her work as a clinician and a judge, Hutchings works with owner-surrendered horses at Heavens Ranch Rescue in Norco. Eighteen-year-old Abigail Martin, who took 5th Place, knew since she was 3 that she wanted to spend her life working with horses. A recent Brighton, Colo., high-school graduate, she also participates in mounted archery and in liberty events (in which you communicate with a halter-less horse with only your body language). 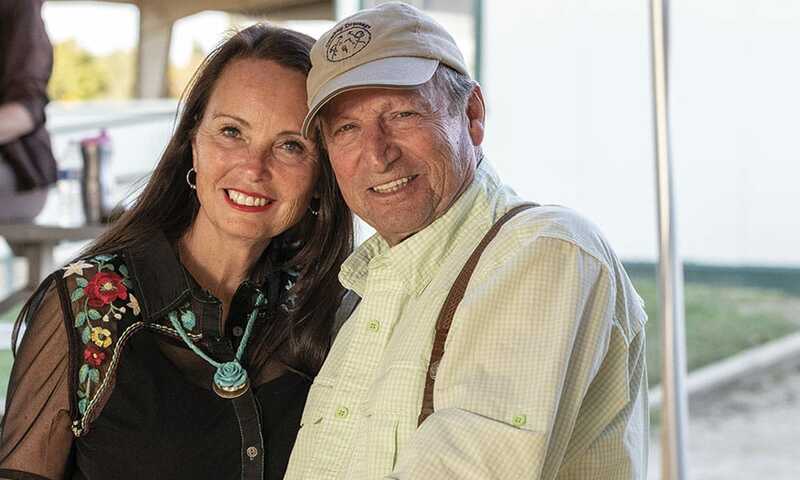 The kindness that is the main tenet of Cowboy Dressage emanates from founder Eitan Beth-Halachmy and his wife Debbie. Buddy wasn’t the only one who saw something special in Martin: After she attended a four-person clinic with Eitan in February 2018, he invited her back for a two-month internship. “Riding is my passion,” says Lesla Bong, who finished sixth. Bong, a registered nurse for 37 years who lives in Walnut Creek, Calif., grew up riding hunt seat on her pony and classical dressage and Western pleasure on her father’s Arabian. In high school, she was champion for San Diego County in hunter seat equitation, both on the flat and over fences. Her current horse, a Trakehner/Thoroughbred cross, had only been ridden three times when she bought him as a 3-year-old. “I trained Cloud in baby steps,” she says, “riding English for dressage and Western on trail. A friend invited me to the Cowboy Dressage World Gathering and Finals the first year it started (2013), and I’ve been coming ever since. Top Hand Champion and Aussie clinician, Tanja Kraus. Kellie Shields, a registered nurse in Clements, Calif., who won Top Hand in 2017, scored an eight-place finish this year on Call Me the Fireman, AKA Beamer. Beamer, a handsome sorrel john mule that’s a real crowd-pleaser, boasts a score of accolades—including being named Western Pleasure World Champion Mule four times. He and Kellie have succeeded in both English and Western events such as driving, gymkhana, jumping, and dressage. Shields—when not on duty at St. Joseph’s Medical Center, serving on the board of the American Mule Association, or showing Beamer—trains mules at Lucy Hill Stables, owned by her mother Chris McParland—an accomplished mule trainer and Master Instructor of Therapeutic Riding. 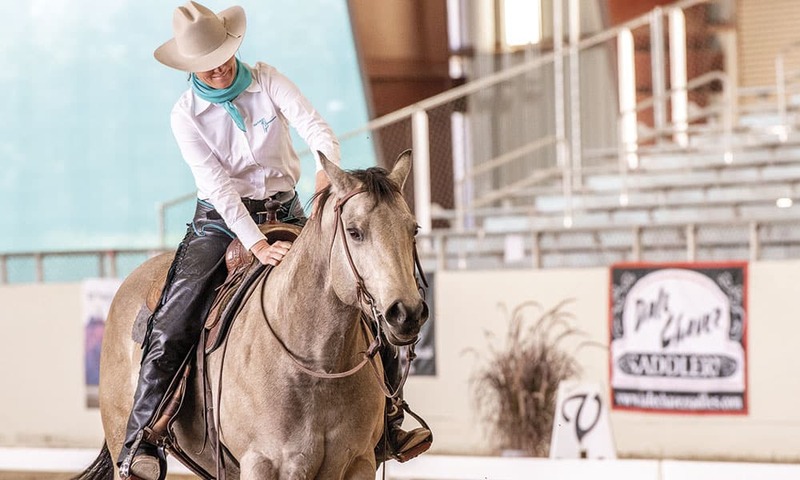 Cowgirl Amy Perry, who operates Cedar Ridge Equine in Bozeman, Mont., took 10th Place in Top Hand on a very special mount: Her Morgan, Holiday Hijo d’Oro, was sired by Eitan’s famed stallion Holiday Compadre. “I bought him when he was about 5 or 6,” she says, “as a project horse, and have brought him along slowly. Perry completed her M.S. in Agricultural Education at Montana State University in 2014 and in 2015 was named one of the “Top 20 Under 40” among southwest Montana’s top young business professionals. A true multi-disciplinarian, Perry trains riders of all ages, abilities, and disciplines as well as training horses in speed/rodeo events, ranch/cow horse events, hunt seat equitation/pleasure, Western equitation/pleasure, classical dressage, Western dressage, and Cowboy Dressage. “My hope is to get Cowboy Dressage started in Montana,” she says. 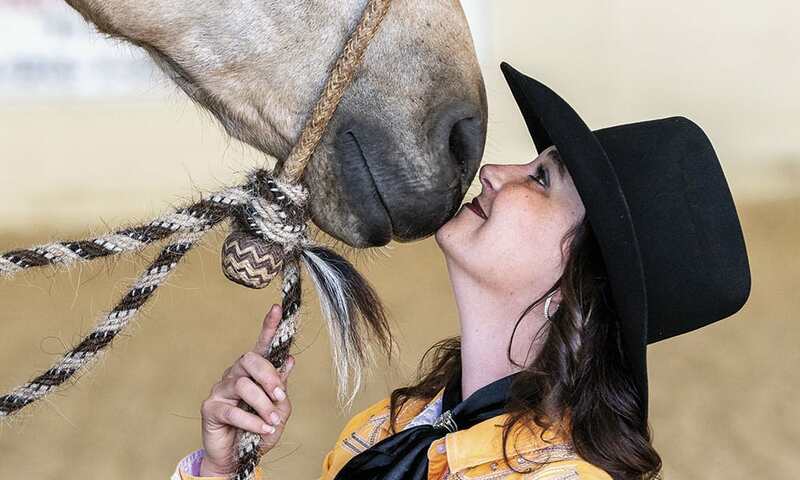 Kindness is the overarching philosophy of Cowboy Dressage, combined with patience, respect, and understanding—qualities exemplified by all of the Top Hand cowgirls. Remarkable to the Top Hand competition is that full time clinicians, trainers, and amateur riders ages 18 to 50-plus can all compete on equal footing, as the judging is not of the horses against one another, but of the human/equine partnership and getting the absolute best out of both rider and horse. “We’re a home for the homeless,” says Eitan with a chuckle. “We welcome all ages, abilities, backgrounds, and breeds to participate and learn.” In fact, Cowboy Dressage suits any rider who embraces the Western lifestyle and wants to strive for helping a horse reach his full potential as a willing and responsive partner. Along with that, Cowboy Dressage is about rewarding the try. “So many riders will say ‘my horse can’t … my horse won’t ….’ By doing so, they create mental barriers to their own success,” says Hutchings. “Cowboy Dressage really makes you accountable, and a better rider, by helping you understand what your horse needs, and giving it to him. 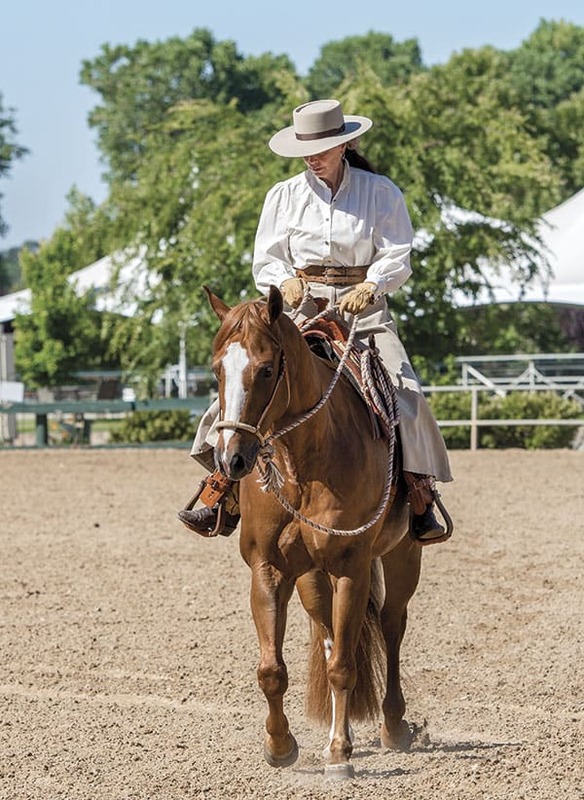 The principles of Cowboy Dressage make you a better rider regardless of discipline—even if you’re just going out on trail. “It’s about putting the horse first, and that all flows down from Eitan. Eitan IS Cowboy Dressage,” says Hutchings. Whether your mount’s a Percheron or a pony, a mustang or a mule, everyone’s welcome in Cowboy Dressage. Cowboy Dressage and Western Dressage, both emanating from Eitan Beth-Halachmy’s training methods and philosophy, split into two separate disciplines around 2013-14. While the two disciplines share some similarities, such as being open to horses of all breed and riders at all experience levels, they also have marked differences. To learn more about Cowboy Dressage, visit cowboydressageworld.com and Eitan Beth-Halachmy’s personal site cowboydressage.com.